August 27th 1977 sees the opening ceremony of Orgyen Chö Ling in Kilburn, London (Princess Road). The first summer school is run as a short, intensive period of study and practice giving a thorough introduction to Buddhism. The 16th Gyalwang Karmapa visits in November with Jamgon Kongtrul Rinpoche. Sogyal Rinpoche teaches on Kunzang Lama’i Shelung in January. The second London Summer School in July and August is called 'Space and Intelligence'. 13th August, Kyabjé Dilgo Khyentse Rinpoche and Kyabjé Dudjom Rinpoche send a message to Orgyen Chö Ling. 15th August-3rd September, Kyabjé Sakya Trizin visits Orgyen Chö Ling. He teaches on Mahayana and Vajrayana in the context of Lamdré. 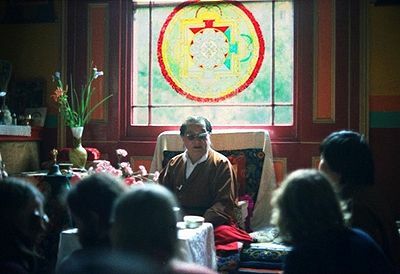 In May, Kyabjé Dudjom Rinpoche, along with Rahor Khenpo Tupten, teaches in London, and stays at Orgyen Chö Ling. He teaches on Dzogchen View and Practice, to up to 250 people at St Mark’s Hall over twelve days. At Chelsea Town Hall he teaches on meditation to two thousand people. He also teaches on Richö to a smaller group of ‘senior students’. Dudjom Rinpoche appends the word 'Dzogchen' to the centre name, Orgyen Chö Ling. The third summer school—Meditation in Action—is held during August and September. Ato Rinpoche gives two teachings, one on meditation practice, the other on the Guru Rinpoche practice called the The Shower of Blessings in January and February. He returned on a regular basis, from April to July. From the 10th to the 14th of March, Sogyal Rinpoche leads A Retreat In the City. During July, Sogyal Rinpoche teaches on Padmasambhava and the Guru Yoga of Jamyang Khyentse Chökyi Lodrö. Sakya Dagchen Rinpoche teaches at the end of July. In September, Sogyal Rinpoche teaches on The Gates of Death in London, beginning with a weekend of teaching at the East West Centre followed by six days of teaching at Dzogchen Orgyen Chöling. Ato Rinpoche teaches in November and December on Faith and A Song of Milarepa. A need had arisen for a place to accommodate larger numbers of people. Alongside this, there is a need to give expression to the openness of the teaching of Buddha and derive full benefit from contact with various disciplines in the arts and sciences. To facilitate these needs, The Rigpa Fellowship, a charitable trust, was founded. Sogyal Rinpoche gives an introduction to Dzogchen and Mahamudra and the nine yanas at in January and February. Tulku Urgyen Rinpoche teaches on the nature of mind on the 14th and 15th February. He gives a teaching to ‘older students’ on the 16th. Chökyi Nyima Rinpoche teaches on the three yanas and the two truths on the 14th and 15th. Ato Rinpoche teaches in February and March on the instruction about How to Listen from Kunzang Lama’i Shelung at Dzogchen Orgyen Chöling. On June 29th Nechung Rinpoche teaches on refuge and Tertön Sogyal. Rigpa opens at St Paul’s Crescent, Camden, in July 1981. This page was last edited on 7 November 2016, at 15:11.